With names just as funky and uniforms just as fresh as the college edition! 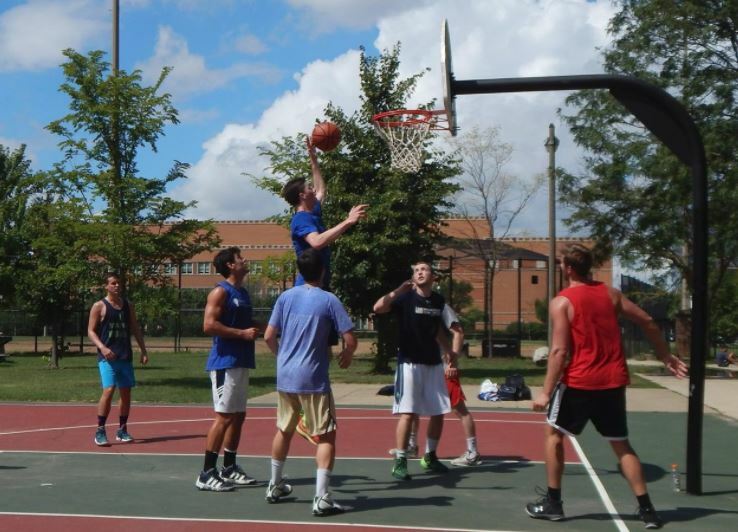 Join us for the Notre Dame Club of Chicago’s Bookstore Basketball Tournament on Saturday, August 11th at Seward Park in Old Town! Don’t miss this opportunity to participate in the alumni edition of one of college’s greatest annual traditions! You loved Bookstore as a student, and you will love it even more as you step onto the court once more as a graduate! At least 3 or 4 of the 5-6 players on each Bookstore Basketball team must have attended the University of Notre Dame. Completed waivers can be mailed to Notre Dame Club of Chicago, 224 S. Michigan Ave., Chicago, IL 60604 or scanned and emailed to director@ndchicago.org. Waivers need to be completed, SIGNED, and sent before team schedules are finalized!